The first decade of the 21st century is now officially over (anyone want to take bets on how long it is before VH1 does a Best of the Aughts series?). I feel like this should be more momentous than it actually seems to be, mind you I thought this about Y2K too and that passed by with more of a whimper than a bang. I thought about doing a roundup of how my eating habits have changed in the last decade, but honestly I can barely remember what I had for dinner last Friday much less what I was and wasn’t eating ten years ago. However, I think I can remember back as far as January 2010, so here are the things I discovered, things I’m cautiously optimistic about, and things which I tried and failed to develop an appreciation for in 2010. I’ve always been a firm naysayer of eggplant. Too greasy, too flavorless, too slimy. The only exception I was willing to carve out was for baingan bharta in which the eggplant is mostly unrecognizable, not oily and any hint at flavorlessness is drowned out by the flavors of Indian spices. Apparently I should have paid more heed to this, because what I’ve discovered is that I really just don’t like eggplant parmesan. Eggplant that comes stir fried in garlic sauce from a Chinese restaurant is excellent. Eggplant that’s cubed and roasted so that the outside gets crispy and the inside stays creamy is a regular feature of my menu now. Eggplant that is fried (menu says roasted, but we can’t figure out how they achieve the texture they do via roasting) and then drowned in rich tomato sauce and garlicky yogurt sauce from our local Persian restaurant is so good that I’m pretty sure it’s terrible for me. So yes, eggplant has been discovered and I suspect that I’d even accept eggplant parmesan if the eggplant wasn’t breaded and fried (I say this because I have a recipe for eggplant parmesan stacks that involves grilling eggplant and pairing it with quick fresh tomato sauce and fresh mozzarella that sounds very tasty). Whole grains in general, but barley is nicely emblematic of this trend. I started cooking with more whole grains in a gesture at a healthier diet and then discovered that they’re really quite tasty, so I can feel both virtuous and enjoy my dinner at the same time. I’m still reserving judgment on whole wheat pasta though. I have a well established love affair with starch in all forms, and giant chewy corn kernals are no exception. My parents are not big Mexican food fans, and my mother apparently loathes hominy so I’d never had it before this year. Dinner this week was all about my desire to eat some hominy (also a desire to eat a meat that wasn’t chicken). I can’t believe I never knew about pumpkin seeds before, they’re so delicious. Who can I blame for my previously pumpkin seed deprived existence? Usefully, pumpkin seeds are also a great substitute for nuts in things like granola or salads if you’re avoiding nuts either because you don’t want the fat content or because you’re allergic. Foods for which I conceived a qualified appreciation of in 2010. Okay, I’m still never going to look at a menu and think ‘ooooh, Brussels sprouts’. And believe me, strange as it may seem, there are actually people (read, my roommate) who do this. However, in a further vindication of the theory that roasting makes everything better, I have discovered that Brussels sprouts if sliced in half and then tossed in olive oil and balsamic vinegar and roasted will become tender and slightly caramelized and are actually quite tasty. No really, I’ve tried. I’ve made them into soups, and served them as side dishes, and curried them and really the only way I like lentils is when they come to me in the form of the buttery slightly tomatoey red lentil soup from our local Persian restaurant. I’ve tried to recreate their recipe but suspect I’m not committing to enough butter to achieve it. I freely admit that I wouldn’t know authentic Mexican food if it came up and said hello to me on the street. I do know that what you get served in a Mexican restaurant in the North-east is probably about as close to authentic Mexican food as The Tudors is to a historically accurate recreation of Henry VIII’s court. 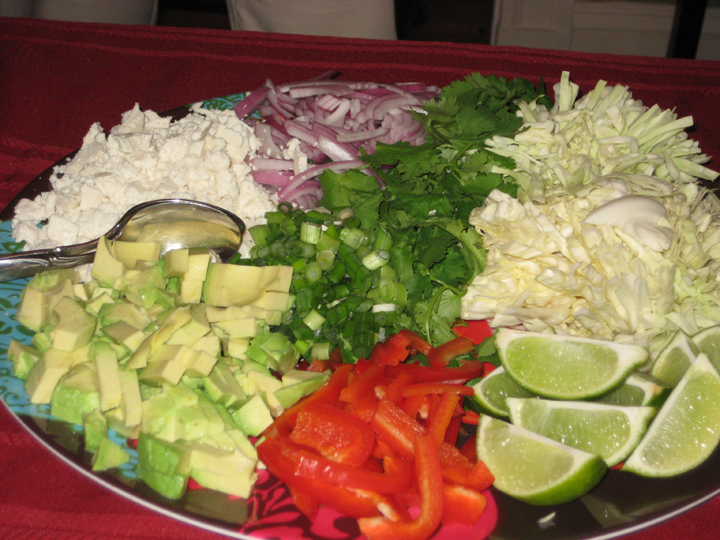 This is a good thing, since while I like all the component ingredients that go into what we refer to as Mexican food (avocado, sour cream, cheese), the end result is somehow never very exciting. This recipe, on the other hand is spectacular, and I think it’s at least in waving distance of authentic. It’s certainly time consuming enough to feel authentic. Note: This looks intimidatingly time consuming, and while I’m not going to claim that this is a quick dinner, it’s not quite as bad as it looks either. I braised the pork and made the chili paste on Sunday afternoon (left the chilis soaking and the pork braising while I cleaned the house). On Monday night I sautéed the onions and dumped everything else in the pot and then turned off the heat. 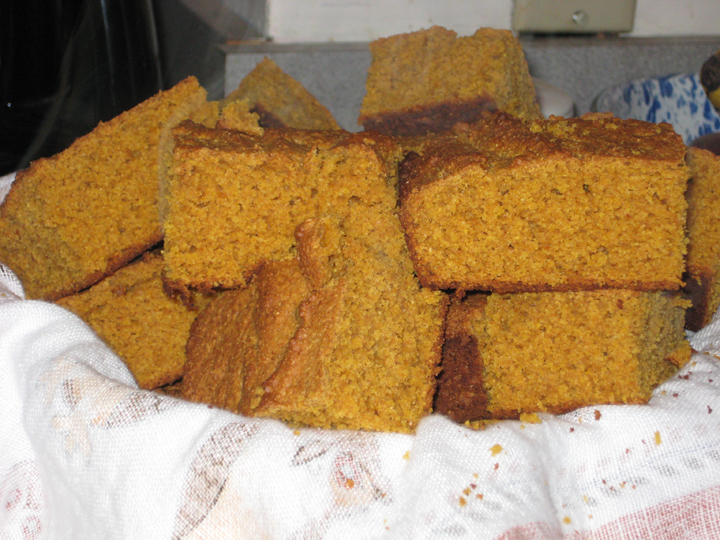 I let it sit in the fridge overnight to marry the flavors and then let it come up to a simmer on Tuesday night while I baked the cornbread and chopped the various accoutrements. Heat oil in heavy large ovenproof pot over medium-high heat. Add sliced onions and garlic to pot and sauté until onions begin to caramelize (about 5-10 minutes – go cut up your pork while the onions do their thing). Add oregano; stir to coat. Sprinkle pork with salt/pepper and add to pot. Add broth. Bring to boil. Cover tightly (I used foil and then the lid of my dutch oven) and transfer to oven. Braise pork until tender enough to shred easily, about 2 hours. 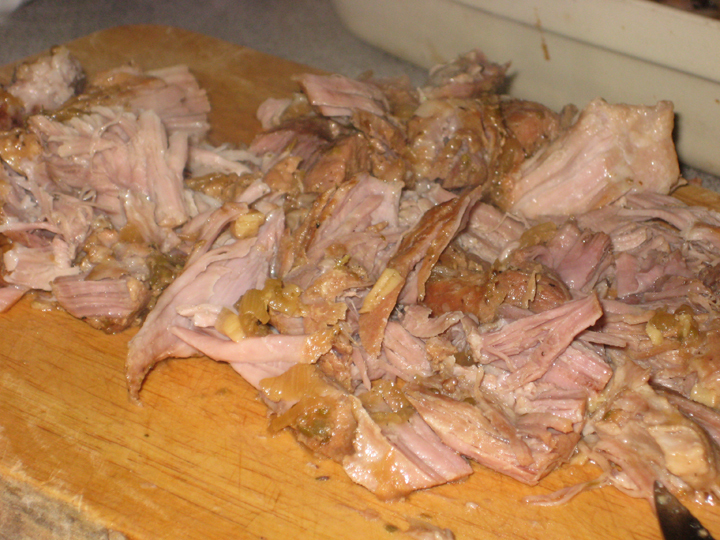 Using slotted spoon, transfer pork to large bowl and shred/cut into bit size pieces. 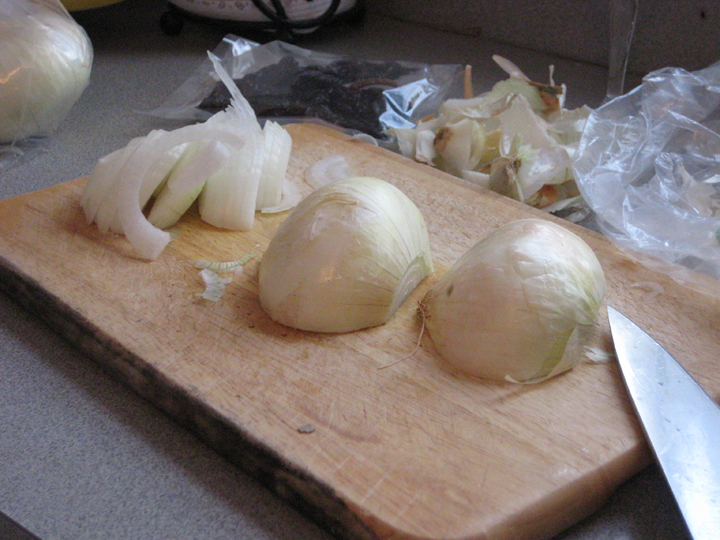 Strain the juices into another large bowl (don’t throw away the garlic/onion residue – add it back to the pork). Cool and refrigerate overnight. Skim fat from chilled juices. Note: The braising liquid that you get at the end of this process is phenomenal, and this is why you want to make sure that you cover your pot tightly – you want to keep as much in as possible. Slit chiles lengthwise, then stem and seed. Heat a large cast-iron skillet over medium heat until hot, then toast chiles in batches, opened flat, turning and pressing with tongs, until more pliable and slightly changed in color, about 30 seconds per batch. 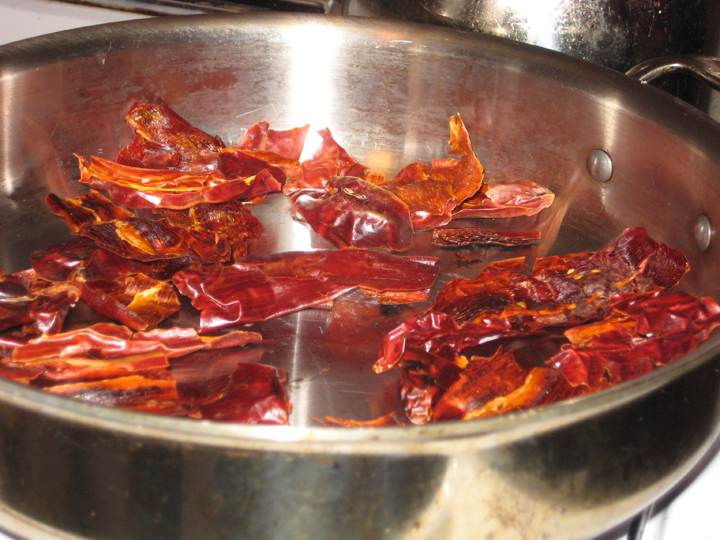 Transfer to a bowl and pour 2 cups boiling water over chiles. Soak, covered, until softened, about 30 minutes. Purée chiles with 1 cup soaking liquid, chopped onion, garlic, clove, and ½ tsp salt in a blender until a smooth paste forms, about 2 minutes. Heat oil in cast-iron skillet over medium heat until it shimmers, then add chile paste (it will spatter) and cook, stirring occasionally, until darkened and slightly thickened, 5-10 minutes. Note: This came out at the perfect level of spicy for me – warm and complex without being so hot that I can’t taste anything else. 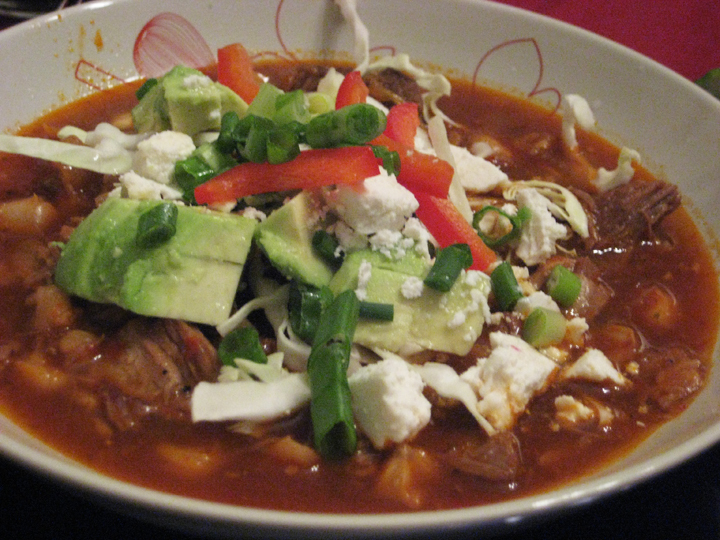 That being said, what gets me to that place is fairly mild, so if you like your food spicier you may want to use more guajillo chiles. Sauté the onion in a little oil until softened and beginning to brown. Add the oregano and stir to coat. Add the reserved pork, chile paste, (defatted) braising liquid, and hominy. Add water and stock to taste (I used about 2 cups stock, and 1 cup water – you could thin this down more if you wanted to stretch the meal or a less robust soup, but be careful how much stock/water you use because you don’t want to drown out all the flavor you built with the braising liquid). Bring to a boil and then simmer for 30 minutes to blend flavors. Add more broth if necessary. Season to taste with salt and pepper. Note: I actually ended up with far more pork than I really wanted in my soup. I kept some out and still ended up with too much meet. I didn’t want to thin the soup down more than I had because I didn’t want to lose the flavor that I’d developed. So, moral of the story is that next time I think I’d use maybe a scant 3lb of meat. Last time I made this we had been threatened with an enormous snow storm that failed to produce much snow at all. This time we were threatened with a huge snow storm that was actually impressive enough that they closed my office and gave me the first snow day I’ve had since the 6th grade. To be more authentic I would probably use some combination of cumin, Adobo, and cilantro rather than oregano to flavor it. but that might just be my taste. I tend to associate oregano exclusively with Italian food. sounds amazing & will have to make it soon.